Burr elm & palisander veneer with black edging & ballerina dancer inlay. Brass turned feet, satin finish. 1 tune 18 note clockwork wound from underneath. A selection of tunes are available to choose from when ordering below. To hear tune samples, click here. 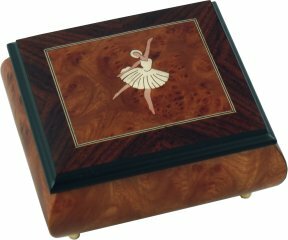 A beautiful, hand crafted musical ring box finished in burr elm with single ballerina dancer inlay. 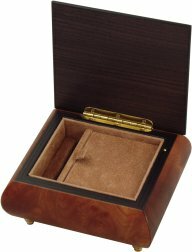 Lift the lid of this finely made music box to reveal the plush lined interior with ring holder strip and play the musical movement. Wound from underneath, the movement can be hidden or on show via the removeable velvet cover. A beautiful music box for your special occasion. For more information on the musical movements used, please click here. The velvet panel can be removed to view the musical movement. Where would you like the tune plaque : On Inside LidUnderside Of Box Help, what is this choice for ?